(CNN) - Former FBI Director James Comey defended the FBI's interview of Michael Flynn that later prompted the former national security adviser's guilty plea, sparring with Republicans in closed-door House testimony Monday over the circumstances surrounding the January 2017 interview. The FBI interview with Flynn at the White House has come under renewed scrutiny and criticism from Republicans after Flynn's attorneys questioned the setting last week, although Flynn told a federal judge Tuesday that he was responsible for his false statements about his contacts with then-Russian Ambassador to the US Sergey Kislyak. A transcript of Comey's testimony was released publicly Tuesday. The five-hour interview Monday was the second that the House Oversight and Judiciary committees conducted with Comey this month as part of the Republican-led congressional investigation into the FBI's handling of the Hillary Clinton and Russia investigations. In the interview, Oversight Chairman Trey Gowdy, a South Carolina Republican, pressed Comey on the purpose of the interview. "It is not the FBI's job, unless I'm mistaken, to correct false statements that political figures say to one another. So why did you send two bureau agents to interview Michael Flynn?" Gowdy asked. "Because one of the FBI's jobs is to understand the efforts of foreign adversaries to influence, coerce, corrupt the government of the United States," Comey responded. "So they were sent there as part of that counterintelligence mission to try and understand why it appeared to be the case that the national security adviser was making false statements about his conversations with the Russians to the vice president of the United States." Gowdy also pushed Comey on comments he had made in a New York forum earlier this month, in which he told a moderator his decision to send two FBI agents to the White House without notifying the White House counsel's office was something he "probably wouldn't have done or maybe gotten away with in a more organized administration." "I'm just kind of hung up on the phrase 'gotten away with,' " Gowdy told Comey on Monday in the private Capitol Hill interview, according to the transcript. "In an administration where the rhythm of the context between the FBI and the White House was more established, there would've been a strong expectation that we coordinate it through White House counsel instead of calling the national security adviser directly. That's what I meant by it," Comey replied. The timing of the interview thrust Comey back into the spotlight over the Russia investigation, as he was quizzed on the Flynn interview the same week that Flynn was supposed to be sentenced by a federal judge, although that sentencing was delayed Tuesday. But memos detailing how the FBI had arranged the interview and the assessment afterward were released ahead of the sentencing date, raising new questions for Comey from Republicans. White House press secretary Sarah Sanders on Tuesday criticized Comey and the FBI for the interview following Flynn's hearing. Leaving Monday's interview, Comey slammed Republicans for failing to stand up to President Donald Trump's attacks on the FBI. "People who know better, including Republican members of this body, have to have the courage to stand up and speak the truth, not be cowed by mean tweets or fear of their base. There is a truth and they're not telling it," Comey told reporters. "Their silence is shameful." Republicans had a starkly different view of Comey's testimony and public comments. Rep. Mark Meadows of North Carolina criticized Comey for saying he bore no responsibility for the FBI's damaged reputation. "All you need to know about Dir. Comey's sanctimonious lecture to Americans today is the fact he takes no responsibility for the erosion of trust in the FBI and DOJ," Meadows tweeted. "The rampant process abuses and breaches of protocol occurred on his watch. He refuses to be transparent about it." In Comey's first interview earlier this month, he defended the FBI's handling of the Clinton and Russia investigations, although Republicans expressed frustration that an FBI lawyer prevented Comey from answering certain questions about the Russia probe. During Monday's appearance, Comey faced extended questions about Flynn. Comey was forced to change his understanding of how the FBI had discussed having a representative of the White House counsel's office present during the Flynn interview after he was presented with a copy of a memo his former deputy, Andrew McCabe, wrote that recapped the conversation McCabe had had with Flynn to set up the interview. "My recollection is the deputy director said, 'If you wish to have someone there from White House counsel, you're welcome to.' I don't remember that he added 'It'll slow down the process' or anything like that," Comey said, before seeing the memo. In the memo, McCabe recalled his conversation with Flynn, writing: "I explained that I thought the quickest way to get this done was to have a conversation between him and the agents only. I further stated that if LTG Flynn wished to include anyone else in the meeting, like the White House Counsel for instance, that I would need to involve the Department of Justice." "You do not think that that left the impression with Gen. Flynn that he needed to go ahead and do it without counsel involved?" Gowdy asked Comey, after Comey reviewed the memo. "I can't speak to the impression it left with Gen. Flynn. I take these words -- in a memo I haven't seen before, but I take them to be accurately recounting what Andy's conversation was," Comey said. "I don't know what Andy meant by 'quickly.' I wanted it done quickly because the best investigations are done promptly, before things sit around and people have an opportunity to take your investigation in different directions. You jump on it; you go get an interview done." But Comey defended the way the interview was handled. "First, the deputy director called him, told him what the subject matter was, told him he was welcome to have a representative from White House counsel there. So he knew what he was going to be asked about. He was an extraordinarily experienced person and so reasonably should be assumed to understand you can't lie to the FBI," Comey said. "Second, it's not protocol. The FBI does not do that in noncustodial interviews. And, third, you want to find out what the witness will say to you before you heat up an interview by raising the prospect that the witness might be lying to you." Republicans pressed Comey on other matters, too, such as the questions he faced from Republican Rep. John Ratcliffe of Texas over disclosing the memos of his conversations with Trump to a professor. Comey admitted that he did not have prior written authorization to release memos to his friend, the Columbia Law professor Daniel Richman, though Comey said he did have written authorization from the FBI regarding the "substance" of the memos later detailed in his book. Comey straddled the line when talking about his memos. He was asked by Republicans whether the memos were "government records" because some of them contained classified information and some were written using FBI equipment. "I was trying to write down what happened, so I could remember it, both because I'm an FBI director and a human being," Comey said. "It was in my official capacity and also in my personal capacity." Comey also said he had written the memos "for the benefit of the FBI and for my personal protection." The memos painted Trump as willing to cross lines with the FBI director and potentially obstruct justice. Most notably, Comey wrote about one White House encounter where Trump asked him to drop the investigation into Flynn. Comey also elaborated on how he had responded in his conversations with Trump. 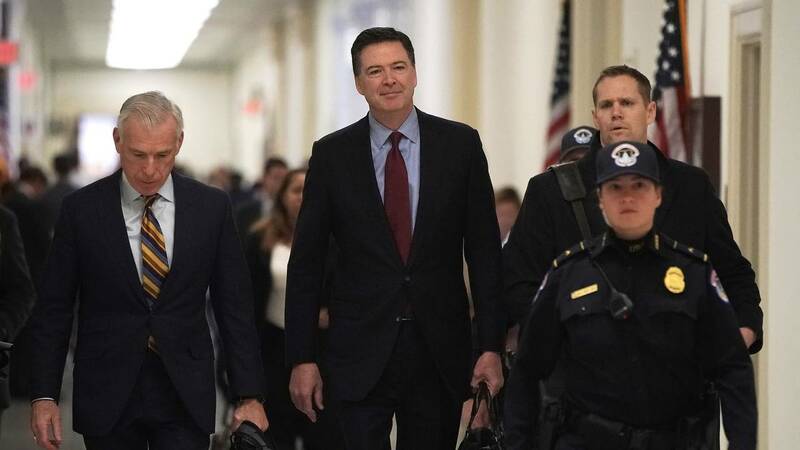 As Trump tried to get law enforcement officials to publicly state that he was not under investigation, Dana Boente, then the acting deputy attorney general and now the FBI general counsel, expressed frustration, Comey said. Trump had called Comey in April 2017 to ask him again to tell the American people that he wasn't under investigation, and Comey told the President that he had already relayed his request to the Justice Department. At that point, Comey's chief of staff spoke to Boente "to tell him that we'd gotten another call," Comey told lawmakers Monday. "Oh, God, I was hoping that would go away," Boente responded "in substance," according to Comey. Comey said he believed Trump's conduct during the 2016 campaign "inevitably (comes) within the scope of the investigation" that Comey oversaw before he was fired in May 2017, and that was of the reasons why he did not want to publicly say Trump wasn't under investigation. As he said in his public hearing last year, Comey also said he didn't want to make that public announcement because it would create a "duty to correct" if the situation ever changed. "To tell him that he wasn't under investigation was potentially misleading because, one, we were investigating people around him; and, two, that his conduct as the head of the campaign would inevitably come within the scope of the investigation," Comey told lawmakers on Monday. Comey was also given the opportunity to respond to Trump's tweet calling the President's former attorney Michael Cohen a "rat" for talking to federal investigators, saying it is demoralizing to the FBI but also "inspires." "It demoralizes, in that our nation is led by someone who has contempt for the rule of law and the institutions that this country needs to be a healthy democracy. So it demoralizes them in that sense. And it inspires them and reminds them of the oath they took to support and defend the Constitution of the United States," Comey said. "And so it wears them down, but it reminds them of why they chose to do this work." Comey wouldn't say that Trump's tweets encouraging people not to cooperate with the special counsel amounted to witness tampering. But when asked about the recent tweets, Comey said that "this conduct by the President may well be within the scope" of Mueller's investigation. "I would imagine that this conduct by the President may well be within the scope of the special counsel's investigation, so I don't want to be offering an opinion on it even if I knew," Comey said. Comey also wouldn't answer whether the FBI had reason to believe in July 2016 that then-presidential candidate Trump himself was "working with Russia to influence the election." Gowdy pressed Comey, who continued: "I think it calls for information that falls within the special counsel's investigation, and I've been instructed by the bureau not to be answering questions that fall within that." This story has been updated with additional developments on Tuesday.